Butterflies' life cycles are a fascinating study. These beautiful creatures are a source of wonder and delight for people of all ages. A butterflies life cycle happens in four distinct stages. The first stage is when the female butterfly lays tiny eggs. The eggs can be round, cylindrical or oval and are carefully attached to leaves, stems, small twigs, and other natural objects. The eggs are laid on a food source for the caterpillars that will soon be hatching from them. They are often laid on the underside of leaves because this offers the eggs the most protection from predators and the hot summer sun. After about five days, an almost microscopic caterpillar emerges from each egg. They are so small that they look like hairs. Some scientists have estimated that the newly hatched caterpillars are twice as long as the diameter of the egg they hatched from. The caterpillars may have spiny hairs, patterns, or other designs on it depending on the species of butterfly it will become. Some are very colorful and others blend in to their habitat. This stage is the time where the butterfly will feed constantly on the host plant. It stores up fat in its body because most species of butterflies do not eat after they emerge from their chrysalis. The first food that a butterfly larva often eats is the shell of the egg it hatched from. As the caterpillar gets bigger, it sheds its skin. This process can happen many times as the creature grows. The skin splits and the caterpillar wiggles out of it. The new skin that covers its body is stretchy and will allow the caterpillar to grow until the process is repeated. The stage in which the caterpillar becomes a beautiful butterfly is called the chrysalis or pupa stage. During this time the caterpillar's organs are chemically broken down and the adult butterfly's structures develop. Some of the adult structures, like the wings, have begun to form while it is still a caterpillar. The other organs that the adult butterfly will need to live, mate, and reproduce will mature during this cycle. Most chrysalises are dull colors that blend easily into the eco-system. They may be green or brown and often look like curled leaves. The insect will stay in the chrysalis until it hatches into a butterfly. Many species of butterflies stay in this stage for the entire winter. For others, it may last only a few weeks to a month. Some scientists have recorded this process by taking a lot of caterpillars and, after they have pupated, opening a new chrysalis each day to see how it changes. 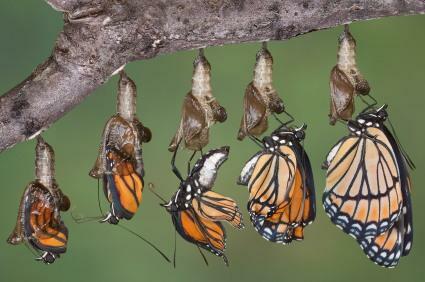 When the transformation is complete, the adult butterfly will emerge from the chrysalis. It will need a period of time for its new wings to dry and become usable. After a period of time, the butterfly will be ready to fly. This is the mature stage of butterflies' life cycle where the insect will court, mate, and lay eggs. It is during this time that the butterfly may move to a new habitat or, for some species, even migrate long distances. How long butterflies live depends on the species of butterfly. Scientists have marked butterflies and then recaptured them to gather information on the average life span. No butterflies live longer than one year. Most species of butterfly live for less than two weeks even in the very best conditions. This is why most butterflies have taken in most of their food as caterpillars and very few actually eat in the mature stage. Butterflies are often killed by predators long before their life spans are lived in full. The Mourning Cloak butterfly hatches in early summer and then spends the winter as an adult. It will court, mate, and lay eggs in the spring. These are some of the longest-lived butterflies, having a life expectancy of almost a year. There are several fascinating sites on the Internet that have information on these interesting creatures. While the life cycle of the average butterfly is very short, the insect brings beauty to its surrounding environment. Most butterfly larvae are not the pests that eat your tomato plants, but are fascinating creatures with an important place in the eco-system. Having a butterfly garden where you can study them yourself is a relaxing hobby and a wonderful way to insure that even the most endangered species of butterfly has a place to call home.